Beauty tools are arguably just as important— if not moreso— than makeup itself. The tools (ie. brushes) that you use can seriously impact the performance of your products. With that said, I don’t have a problem splurging for really nice brushes here and there. Plus, as long as you take care of them and make it a point to wash them regularly, they can last you years. However, it’s always an awesome feeling to score high quality brushes at a drugstore price. 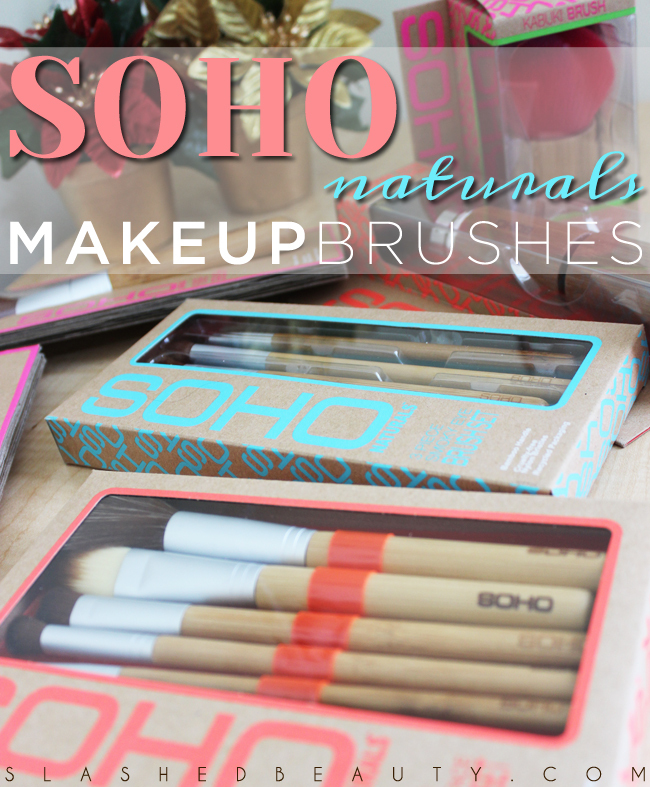 I first came across SOHO brushes at Walgreens a couple years ago, when I was in desperate need for a new blending brush. Their Pro Crease Brush became my favorite eye brush that I still use daily. SOHO just released their Naturals line of brushes that are soft, high-performing, and most importantly: affordable. They all have a fashionable bamboo handle with super soft, cruelty-free nylon bristles that won’t soak up much product and will last through cleanings. Also, their packaging is made from recycled materials. 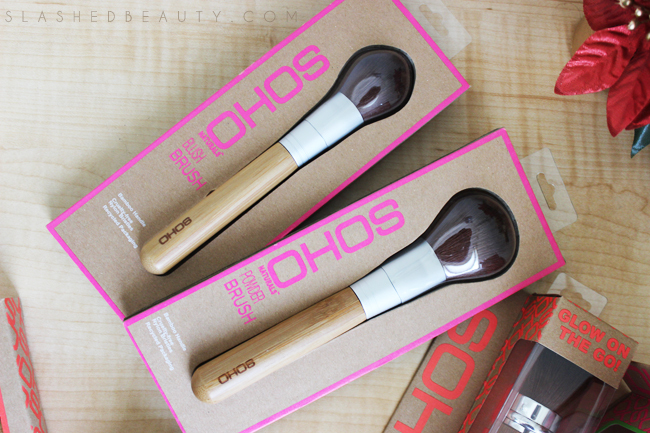 First up we have the SOHO Naturals Blush Brush ($10) and Powder Brush ($10). These are both dense brushes that can pick up a bunch of product and diffuse it across the face easily. The Powder Brush has a large, round shape that can cover a lot of surface area at once. The Blush Brush comes to a very subtle taper for more precise application of blush. The Naturals line includes two new kabuki brushes that are both unique. The SOHO Naturals Kabuki Brush ($13) is a large standard kabuki with fluorescent pink bristles that are incredibly soft. The wide base makes it easy to grip and, again, the bristles are dense but flexible. 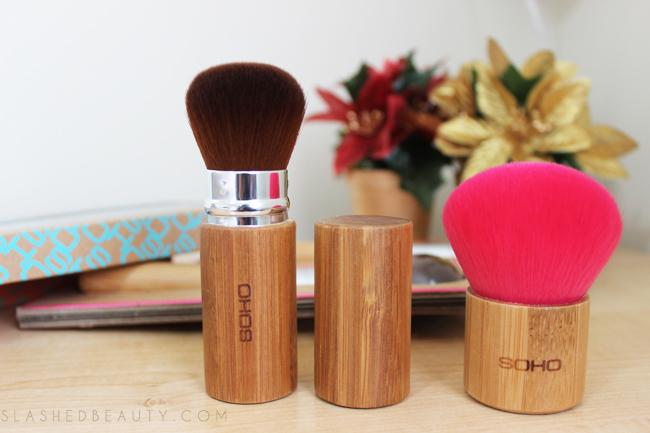 The SOHO Retractable Kabuki Brush ($15) has a slightly smaller brush head that will slide into its handle and fit into the matching bamboo cap. This is a great way to carry a brush with you on the go without worrying about damage or getting it dirty. The stars of the Naturals line are the sets. The SOHO Naturals 3-Piece Smoky Eye Set ($12) includes three must-have eye brushes for every look: a wide all over eyeshadow brush, a thin angled eyeliner brush (which can also be used to fill in and define your brows), and a stiffer smudge brush to really smoke out your shadows and eyeliner. 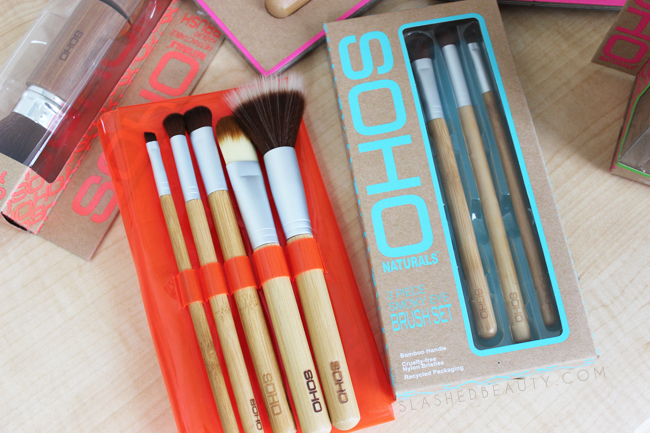 The SOHO Naturals 6-Piece Fresh Face Set ($17) is the best value, as it has all the basics for a full face of makeup. It includes the same three brushes from the Smoky Eye set, as well as a flat foundation brush, a loose stipple brush for powders, plus an orange brush pouch for traveling. You might as well pay the extra $5 for this bundle instead of the Smoky Eye Set, since it comes with those same three eye brushes plus the two for the face and a case. Each brush and brush set come with a tutorial on the back showing you how to use the brushes for the best application. They all pick up so much product and distribute makeup very well, all while feeling pleasantly soft. These would be great for beginners and makeup pros alike, since you can grab everything you need for beautiful application at a low price. Do you normally splurge or save on brushes? Affordable AND work good?! WINNER. These look awesome! I love affordable brush options! You should! I’d love to hear how you’d like them. I have a few SOHO brushes and they held up well after a few years. Yes! I’ve had their blending brush for about 2 now and it’s just as soft as when I first purchased it. These brushes sound nice. They look pretty. These look nice and fluffy! I’m totally a saver! I pretty much have the entire line of ELF studio brushes lol. And some from real techniques, etc. But I recently discovered the collection of brushes from our Canadian brand here, QUO (Shoppers Drug Mart) and they go on sale occasionally. On the last sale, I purchased a bunch and they are amazing! They aren’t super expensive, but they’re not cheap either. To get them on sale was amazing, and then to discover just how amazing high quality they are, total bonus! I’m hooked on them now and I guess I’m a splurger now! I have both cheap brushes from e.l.f/RT as well as some more fancy ones from Sigma and It Cosmetics. I don’t feel as guilty splurging on brushes since they will last me at least two years when I’m good about washing them. But I do tend to use my more affordable ones more frequently! I love brushes, and love trying as many as I can, from ELF to Hakuhodo! I think the bamboo handle on these is so pretty! I’d never heard of this brand. I’ll check them out when I’m next in Walgreens. These are great sets, especially for newbies since it has instructions on how to use them. The pink kabuki is pretty! Shop through these banners to help support Slashed Beauty. 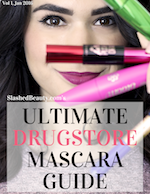 Sign up for the weely Slashed Beauty email newsletter and receive a free download of the Ultimate Drugstore Mascara Guide. 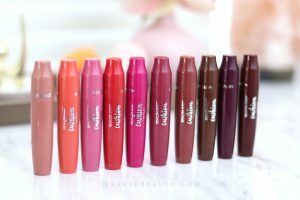 See over 40 drugstore mascaras swatched and compared side by side!